Ginseng is a group of plants belonging to the genus Panax, consisting of several species of slow-growing perennials with fleshy roots, in the family Araliaceae. Ginseng grows in Korea, China, Japan, Siberia, Vietnam, and North America and is considered to be one of the most important plants in herbal medicine, with many health benefits arising from consumption of the root and its extractives. Resembling at times a human body, ginseng roots have been considered to have wide ranging effects, benefiting the body as a whole. Ginseng has perhaps the longest continuous history of usage of any healing herb. Sometimes referred to as the "root of heaven," ginseng is a good example of an ancient herb that Western medicine is just beginning to study and understand. The Korean ginseng plant, Panax ginseng, prospers in a cool, temperate climate at a latitude of 30-48 degrees North and an altitude of 100-800 meters. This perennial plant grows to a height of about 60 cenitmeters in the wild and up to 90 centimeters when cultivated. It takes about six years to reach maturity. The plant requires shade and does not grow well in direct light. The mature plant has three to four palmately compound leaves, with each leaf comprised of five leaflets. The flowers have five small yellow to pink petals arranged as an umbel. The berries are flat, oblong, and green when immature and become bright red at maturity. One to two grayish white seeds form within each berry. The plants bloom and produce berries three years after sowing. Cultivated ginseng yields 40-60 seeds per plant. The most prized portion of the plant is the main root, which is large, bifurcated, and white to yellow-white in color. When fully mature, Korean roots sometimes resemble the human body with head, trunk, arms, and legs; but many times a large number of lateral roots or rootlets obscure the "ideal shape" of the main root. The root surface is wrinkled with grooves, resembling a parsnip. At the top of the root sits a rhizome, which increases in length and has a regeneration bud at its apex. According to the "doctrine of signatures," the shape of a plant's parts provide a clue about which part of a human being can be aided by the plant. For example, a shelled walnut, which resembles the brain, would be considered good for brain health. Likewise, a ginseng root that resembles the human body would be considered good for all parts of the body. The word panax is derived from the Greek word pan, meaning "all," and the Greek word akos, meaning "remedy." The literal translation is "a remedy for all things." The six year old root weighs about 75 grams, but sometimes reaches 300 grams. It is about 7 centimeters long with a maximum diameter of 2.5 centimeters. The size of the root depends on the quality of the soil and the amount of water available. The wild plants have a slightly different appearance than those that have been cultivated. Once ginseng has been harvested, it cannot be planted optimally in the same soil for 15 years. The soil must be rebuilt and tilled with fresh leaves, such as oak (World Ginseng Expo 2006). There are 11-12 recognized species of ginseng, depending on the method of classification. The following list contains all known species of ginseng (Awang 2003). Many people refer to "Siberian Ginseng" (Eleutherococcus senticosus) as a type of ginseng but it is not considered a "true" ginseng. It has a woody root instead of a fleshy root; and it contains eleutherosides instead of ginsenosides. The English word ginseng derives from the Chinese term rénshēn (simplified: 人参; traditional: 人蔘), literally "man root" (referring to the root's characteristic shape, resembling the body of a person). The word ginseng originates from the Japanese reading of the very same Chinese characters. It was originally the common name for several plants valued for their medicinal properties. Although ginseng is now associated with the genus Panax, some researchers believe that the original ginseng used in ancient China may have been a different plant. Ginseng is usually thought of as an Asian plant, but American ginseng has been used by Native Americans in the United States for centuries. There are many legends that have created a mystique about ginseng as the "King of Herbs." It is said that ginseng has been used in the Orient for five thousand years. The earliest documented usage of ginseng (Bae 1978) appears in a two thousand-year-old Chinese book of the Chien Han Era (33-48 B.C.E.). The first mention of ginseng as a medicine was by the Chinese physician, Chang Chung-ching, who lived during the Latter Han Dynasty (196-230 C.E.). In his book, Shang han-lun (translated as “A treatise on diseases caused by cold”), he described 113 prescriptions of which 21 used ginseng. In the book Shen Nung Pen Ts'ao Ching, translated as “The Book of Herbs by Shen Nung” or “The Divine Husbandman's Materia Medica,” ginseng and gold fragment are described as important preparations for the "elixir of life" to produce eternal youth and immortality (Bae 1978). Although the true authorship of this book is unknown, it was revised sometime between 456-536 C.E. by T'ao Hung Ching. This book is purported to represent the early experiments of the legendary emperor Shen Nung—considered by many to be the father of Chinese agriculture, medicine, and acupuncture. The German botanist Nees Von Esenbeck first classified Korean ginseng as Panax shinseng var. coraiensis Nees in 1833, with the term coraiensis referring to Korea as its wild habitat. The Russian botanist Carl Anton Meyer renamed the plant Panax ginseng in 1843. For many years, Korea has operated the Office of Monopoly, to safeguard and oversee the quality of ginseng that is produced in Korea. All ginseng products that are sold must bear the seal of the Office of Monopoly. It is illegal to remove ginseng seeds from Korea in an attempt to cultivate them elsewhere. The ginseng root has been the focus of many chemical studies in an attempt to understand the nature of its active ingredients. This section will focus on those compounds that seem to be specific to ginseng. Many plants contain a group of compounds known as saponins, but the saponins within ginseng are unique and have been named ginsenosides. These compounds resemble steroids and are known as tetracyclic damarane saponins, which have carbohydrate groups attached at several points. When, in the course of isolation, the carbohydrate portion is removed, the remaining portion is called an aglycone or sapogenin and can be categorized as either a panaxadiol or a panaxatriol. The ginsenosides were first isolated by thin layer chromatography and named alphabetically according to how far they migrated on the plate in a given system, such as Rb1, Rb2, Re, Rc. At present, about 30 ginsenosides have been identified (Kennedy et al. 2003), each of these can be further classified as belonging to either the panaxadiol group, panaxatriol group, or the oleanolic acid group. Within the ginseng plant, the precursors of the panaxadiol type and panaxatriol type are known respectively as protopanaxadiol and protopanaxatriol. Similarly, within mammals, the metabolic breakdown products have been identified as either protopanaxadiols or protopanaxatriols. Ginseng root also contains a group of compounds known as polyacetylenes. One of these, panaxynol or falcarinol, was able to stimulate neurite growth in cell culture (Wang et al. 2006). The U.S. Food and Drug Administration (FDA) has placed ginseng on its G.R.A.S. (Generally Recognized As Safe) list when it is used in the form of a tea. This is based on a long history of human usage. Davis' Drug Guide (Deglin 2006) states that ginseng should not be taken under the following conditions: pregnancy, lactation, certain mental disorders, hypertension, asthma, and infection. Nor should it be consumed by children, organ transplant recipients, or people with hormone-sensitive cancers. These are normal precautions and do not indicate that ginseng has been shown to have adverse effects when taken under the above conditions. The guide says common oral doses of ginseng are 1-2 grams of root per day or extract at 900 milligrams/day. Ginseng water extract has an LD50 in mice of 1400 milligrams/kg (Gold et al. 1999). One report of side effects of ginseng comes from a Los Angeles physician who performed a survey of 133 people who were using ginseng (Siegel 1979) and found that 10 percent reported nervousness, irritability, insomnia, skin eruptions, and morning diarrhea. He coined the term "ginseng abuse syndrome." However, all of those people experiencing this "syndrome" were also consuming caffeine. He later admitted that some of these people were taking very high doses of ginseng in order to get "high." Ginseng has a long oral tradition of being a plant with the ability to cure all human diseases. This tradition is linked to the "doctrine of signatures" and the shape of the ginseng root resembling a human body. In Shen Nung Pen Ts'ao Ching, it is claimed that ginseng is a tonic for the five viscera, quells animal spirits, establishes the soul, allays fear, expels evil effluvia, brightens the eyes, opens up the heart, and benefits the understanding (Bae 1978). Thus, ginseng was believed to have not only physical effects on the body, but metaphysical effects as well. There are many legends about the ability of ginseng to increase stamina or endurance. There are tales of a king trying to determine which of two ginseng roots had more "power." He called two men of equal stamina. He placed one slice of the questionable root into the mouth of one man. He placed a similar slice of a known good root into the mouth of another man. The man who could walk the farthest distance had the better quality ginseng. Experiments on animals and humans have yielded mixed result. Physical activity and long life. Experiments with mice to determine whether ginseng would enhance swimming endurance or longer life when under stress gave negative results (Lewis et al. 1983). Attempts to demonstrate that ginseng or ginseng extracts will enhance athletic performance have yielded inconsistent results (Kennedy et al. 2003). Cognitive improvements. Cognitive improvements have been observed in healthy people when given standardized ginseng extracts of either 100 milligrams twice a day for 12 weeks or 400 milligrams/day for 8-9 weeks. The first group showed improvement in reaction time, logical deduction, and cancellation tests. The second group showed improvement in auditory reaction time and the Wisconsin card sort test (Kennedy et al. 2003). Nurses at a London hospital were given ginseng or a placebo on three consecutive days before night duty. The nurses who received ginseng reported feeling more alert and performed better on tests for speed and coordination (Hallstrom et al. 1982). Circulatory system. Ginseng has been reported to cause either decreased blood pressure or increased blood pressure. In some cases, it enhanced the recovery of cardio-hemodynamic functions in patients undergoing open heart surgery. Scientists at the Massachusetts Institute of Technology have discovered that ginseng extracts with a ratio of Rg1/Rb1 greater than one will promote growth of new blood vessels (angiogenesis) and a ratio less than one will inhibit growth (Sengupta et al. 2004). Insulin and glucose levels. Panaxan B, a glycan, has been reported to elevate plasma insulin and increase insulin sensitivity in mice (Suzuki et al. 2006). Along these same lines, human beings given ginseng extracts showed a lowering of fasting blood glucose levels and HbA1c. Respiratory system. A proprietary extract of American ginseng was effective in preventing acute respiratory illness due to influenza among older adults in a rest home setting (McElhaney 2004). Quality of life. A group of 338 people who received ginseng plus multivitamins every day for 12 weeks experienced significant improvement in their quality-of-life index compared to the controls receiving only multivitamins (Caso Marasco et al. 1996). Cancer. Panax ginseng appear to inhibit some characteristics associated with cancer in animal models; nevertheless, this effect is unclear in humans (Shin et al. 2000). Nervous system. Ginseng has been reported to have effects on the central nervous system. In one case, it showed a neuroprotective effect in protecting hippocampal neurons. In other research, ginseng was reported to act on the hypothalamic-pituitary-adrenal axis by either increasing or decreasing plasma levels of corticosterone. 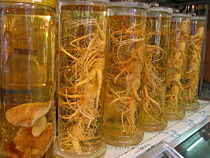 Many of the physiological effects of ginseng have been reputed to be due to a stimulation of the synthesis of NO (nitrogen monoxide or nitric oxide) in various organs and tissues. There are two types of reports dealing with the efficacy of ginseng: (1) those that use the root itself and (2) those that use an extract of the root. The earliest usage of the root was most likely in the raw form. Later, it came to be used as a tea, when it was sliced and steeped in hot water. Eventually, concentrated extracts were prepared with water and ethanol. These dark liquid extracts are still available throughout Asia. Further concentration can be accomplished by using heat and vacuum to produce a solid extract, which can be either consumed directly or redissolved in hot water to make a tea. Experiments on the efficacy of ginseng often produce contradictory results. One possible reason for this is that the ginseng used has not been analyzed to determine the concentration of active ingredients. Several companies now offer a standardized extract of ginseng with known amounts of ginsenosides. According to Traditional Chinese Medicine (TCM), Panax ginseng C.A.Meyer (Korean ginseng) promotes yang energy, improves circulation, increases blood supply, revitalizes and aids recovery from weakness after illness, and stimulates the body. Panax quinquefolius, North American ginseng, is particularly prized in Chinese societies, and many ginseng packages are prominently colored red, white, and blue. Most North American ginseng is produced in the Canadian provinces of Ontario and British Columbia, and in the state of Wisconsin in the United States. According to TCM, American ginseng promotes yin energy, cleans excess yang in the body, and calms the body. The reason it has been claimed that American ginseng promotes yin (shadow, cold, negative, female) while East Asian ginseng promotes yang (sunshine, hot, positive, male) is that, according to traditional Chinese medicine, things living in cold places are strong in yang and vice versa, so that the two are balanced. Asian ginseng grows in Manchuria and Korea, a colder area, so ginseng from there is supposed to be very yang. Originally, American ginseng was imported into China via Canton, China, the seaport next to Hong Kong, and Chinese doctors believed that American ginseng must be good for yin, because it came from a hot area. 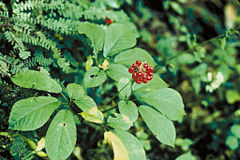 However, they did not know that American ginseng can only grow in temperate regions. Wild ginseng is ginseng that has not been planted and cultivated domestically, rather it is that which grows naturally and is harvested from wherever it is found to be growing. It is considered to be superior to domestic ginseng by some authorities. Wild ginseng is relatively rare and even increasingly endangered, due in large part to a high demand for the product in recent years, which has led to the wild plants being sought out and harvested faster than new ones can grow. Red ginseng (simplified: 红蔘; traditional: 紅蔘), is white ginseng that has been heated, either through steaming or sun-drying. It is frequently marinated in an herbal brew, which results in the root becoming extremely brittle. This version of ginseng is associated with stimulating sexual function and increasing energy. Red ginseng is always produced from cultivated roots, usually from either China or South Korea. A double-blind, crossover study of red ginseng's effects on impotence show a marked positive effect (Hong et al. 2002). A study also showed that red ginseng reduced the relapse of gastric cancer versus control subjects (Suh et al. 2002). A study of ginseng's effects on rats show that while both white ginseng and red ginseng reduce the incidence of cancer, the effects appear to be greater with red ginseng (Yun et al. 2001). In 1969 two Russian scientists, Brekhman and Dardymov, proposed that any substance that increased the nonspecific resistance of an organism should be called an adaptogen. Ginseng and many other plants were considered to be adaptogens. Adaptogens should be innocuous and cause minimal disruptions in the physiology of the organism. They found that when rats were given high levels of X-ray radiation, ginseng was able to double their lifespan and thus had a radioprotective effect. One characteristic of adaptogens, such as ginseng is considered, is that they have a normalizing effect. If an organism has high blood pressure, ginseng will lower it and if the blood pressure is low, ginseng will increase it. The direction of action is toward the normal level. Awang, D. V. C. 2003. “What in the name of Panax are those other.” HerbalGram (The Journal of the American Botanical Council) 57: 35. Bae, H.-W. (ed.). 1978. Korean Ginseng. Korea: Korean Ginseng Research Institute. Brekhman, I. I., and I. V. Dardymov. 1969. “New substances of plant origin which increase nonspecific resistance.” Annual Review of Pharmacology 9. Hallstrom, C., S. Fulder, and M. Carruthers. 1982. “Effects of ginseng on the performance of nurses on night duty.” Comparative Medicine East and West 6 (4): 277-282. Kennedy, D. O., and A. B. Scholey. 2003. “Ginseng: Potential for the enhancement of cognitive performance and mood.” Pharmacology Biochemistry and Behavior 75 (3): 687-700. Elsevier Science Inc.
Il Hwa Co. 1977. Korean Ginseng Studies, vol.1. Seoul, Korea: Il Hwa Co. Ltd.
Siegel, R. K. 1979. “Ginseng abuse syndrome.” Journal of the American Medical Association 241: 15. Suzuki, Y., and H. Hiroshi. 2006. “Mechanisms of hypoglycemic activity of panaxans A and B glycans of Panax ginseng roots: Effects on plasma level, secretion, sensitivity, and binding of insulin in mice.” Phytotherapy Research 3 (1): 20-24. World Ginseng Expo 2006. 2005. Understanding of Korean Ginseng.] Access date: December 4, 2006.